Image taken from Officer Samayoa’s body-worn camera. The mother of the unarmed man who was fatally shot by a rookie San Francisco police officer earlier this month is suing the officer and the city of San Francisco for what they allege was an unlawful killing. Civil rights attorney John Burris, who is representing Keita O’Neil’s mother, announced the lawsuit Tuesday at a press conference at Cornerstone Missionary Baptist Church, just blocks away from where the shooting took place in the Bayview. Burris is also calling on District Attorney George Gascón to file charges and prosecute the officer who killed the unarmed man. On Dec. 1, Officer Christopher Samayoa, a recent graduate of the police academy, shot and killed 42-year-old Keita O’Neil at the Alice Griffith housing project in the Bayview. Minutes before, O’Neil allegedly stole a California State Lottery van and led police on a chase through the southeastern corner of the city. After the shooting, police found no evidence that O’Neil was armed. Police also said that Samayoa was accompanied in the car by a field training officer, who has not yet been identified. The incident was captured on Samayoa’s body-worn camera and shown to community members during an emotional community meeting at a Bayview church a week after the incident. 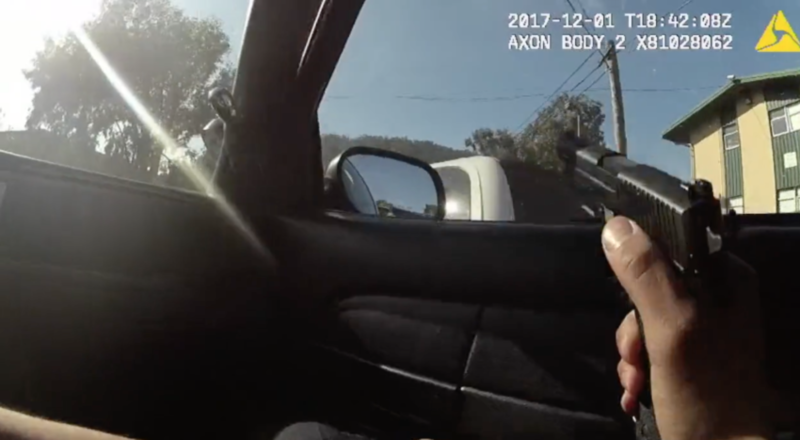 The lawsuit, filed in U.S. District Court for the Northern District of California, alleges that Samayoa did not warn O’Neil before willfully and intentionally shooting him through the passenger window of his patrol car. “The rookie officer used deadly force without providing Mr. O’Neil a single command to stop, or warning that if he didn’t stop, he would shoot,” Burris said in a statement. Moreover, the lawsuit charges that the patrol car was moving when Samayoa fired his gun — a violation of SFPD’s use-of-force policy. “Mr. O’Neil was unarmed and simply trying to get away and did not pose a threat to the safety of the officers who were located inside of a closed and moving patrol car when Officer Samayoa made the decision to shoot him in the head,” Burris said. The lawsuit also alleges that training officer who accompanied Samayoa did not stop the officer from aiming and firing his gun and did not activate his own camera. The latter is a violation of SFPD policy. “This is an example of a poorly trained and negligently supervised San Francisco police officer causing fatal injury,” Burris said. The City Attorney’s Office has received the lawsuit and is reviewing it, City Attorney spokesperson John Coté said in a statement. “What we do know is that, at the time of the incident, [O’Neil] was driving a van that had been carjacked, the driver of the van had been assaulted during the carjacking, and [O’Neil] was leading the police on a high-speed chase,” Coté said.